WOULD YOU LIKE TO BE PART OF THE BIGGEST COMBAT SPORTS' AND MARTIAL ARTS' EVENT EVER PROMOTED? 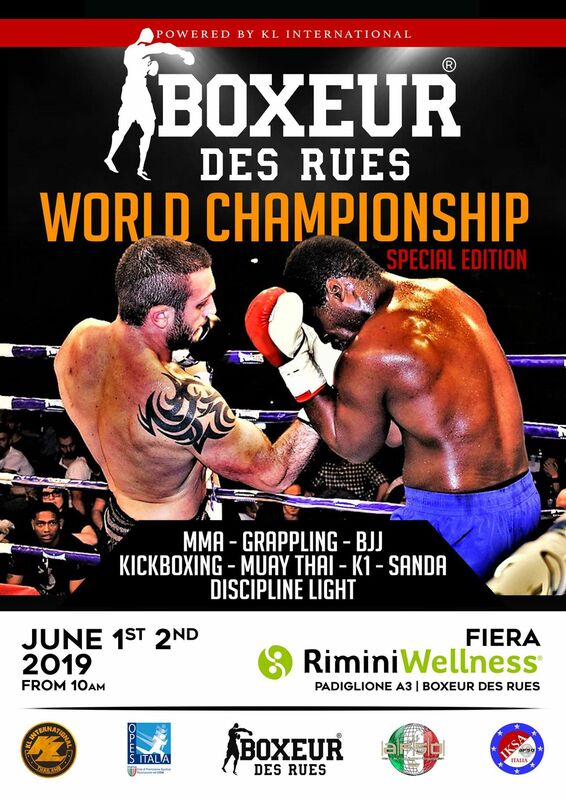 We are proud and honoured to invite you to the 6th edition of the “Boxeur Des Rues World Championship by Kombat League” that will take place from june 1st to june 2nd, in Rimini. Our goal is to organize the most prestigious event of martial arts and combat sports in Europe. After the big success of the five last editions of the event, we decided to repeat this year the experience, if it is possible even better than last one, keepig a new city, with the most famous italian beach, well know as the best italian city for holiday. Thanks to the foreign countries, which participated to the event, we had a great success and many italian fighters could compete with representatives of all countries of the world and therefore we wanted to thank all of you for giving us such trust and would like to invite you once more this year. The Competitions will be Open to any Association which has an agreement with any Federation or promotional Organization, with an unlimited number of competitors without any restriction. The Tournament will be held in Rimini, Italy, one of the most important and famous italian cities. Competitions will start officially saturday june 1st and finish on sunday june 2nd 2019. 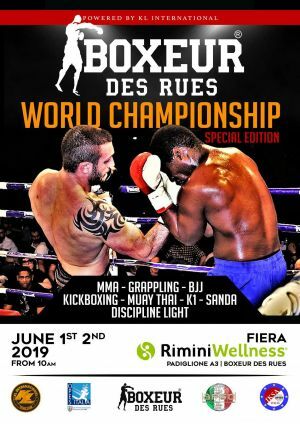 Sunday june 2nd we will have a professional gala, including the best finals 1st serie of the Boxeur Des Rues World Championship by Kombat League. You can look at the program to see which discipline will be held in which day here. - MUAY THAI WORLD CHAMPIONSHIP. - PROFESSIONAL GALA MUAY THAI/K1/MMA, sunday afternoon june 2nd 2019. On MAY 31ST, the venue will be prepared for start to register all the foreign and italian teams which will arrive there. It will also possible to make weight is and make medical controls. Teams registration will continue also during the following days, since some disciplines/categories (for example the babies or submission) will be organized in one unique day and on the 1ST of june, all the eliminatories of the World Championship will also start. Soon will be published the specific calendar. The admission fee for each discipline is 40,00 euro; 10,00 euro for the second discipline (who wants to compete in 2 disciplines/styles: 60,00 euros), 10,00 euro for the third discipline (who wants to compete in 3 disciplines/styles: 70 euros). Each athlete can compete in a no limit number of disciplines. If there are accompanists interested to come and see the competitions, the entrance fees will be 20 euro for all (4) days. - JUDGES AND REFEREES MUAY THAI/K1/KICKBOXING SEMINAR for starters and also only to update your level. 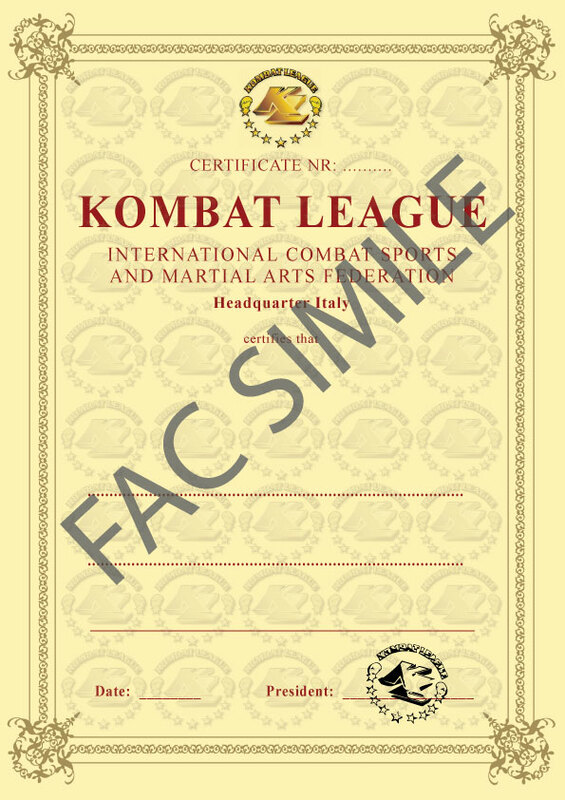 New International Certification will be released from Kombat International. If you want to become a Judge or Referee, during those days you can do it! If you just want to upgrade your already existing certification, you also can do it!